Who must file a IFTA Quarterly Filing. Every US based motor carrier issued a permit under the International Fuel Tax Agreement is required to file an International Fuel Tax Agreement (IFTA) Tax Return, each quarter. Go to www.iftach.org for jurisdiction’s current tax rates, tax rate footnotes, exemptions, and general IFTA information. Who Can Participate in IFTA quarterly filing? In order to participate in the program, you must be registered with the Excise Tax Division as an IFTA or Intrastate Carrier and have an access code which has not expired. If you have questions regarding registration, internet requirements, or receipt and use of the access code, please contact the Excise Tax Division. The Division contact information is listed below under the ‘Need Additional Information’ section. If the due date is a Saturday, Sunday or legal holiday, the next business day is considered the due date. The date that the tax return is paid in full is the filing date. Paper filings must be postmarked by the due date. The licensee will be subject to the IFTA penalty and interest provisions if the report is not filed in a timely manner. Operating suspensions will be applied to delinquent accounts. 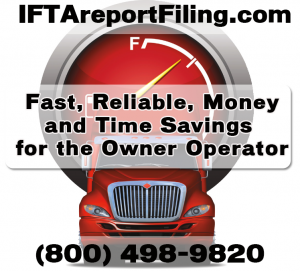 The IFTA/Intrastate staff at IFTAreportFiling.com will provide filing services for all registered Intrastate carriers plus assist in securing the the credentials (license and decals). Also, the staff reminds all registered International Fuel Tax Agreement (IFTA) carriers to submit trip sheets for quarterly IFTA returns, pay amounts due and order credentials (license and decals). The IFTAreportFiling department will offer the convenience of completing transactions 24 hours a day, 7 days a week and file by due the due date for the quarter. Payments can be made by check, Mastercard, or Visa.